Bright and flavorful are words that describe the taste of this hearty salad. But the best part of this type of salad is its presentation. Arrange the salad toppings in an artistic design, then leave a set of tongs for your guests to take what they’d like. 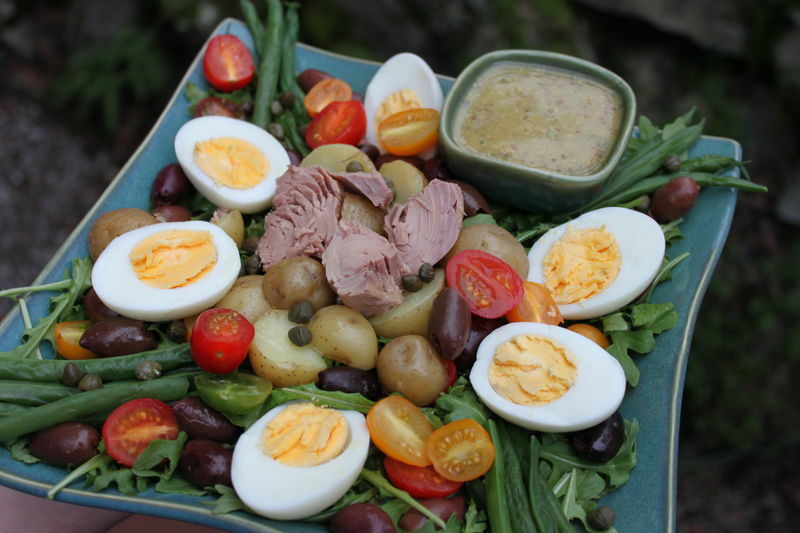 A vinaigrette is essentially an oil and vinegar dressing. To keep it from separating you need to create an emulsion of those two ingredients – combing ingredients that don’t mix easily together. Using a whisk, or blender, the key is to very slowly drizzle in the oil into the remaining ingredients while continuously mixing. 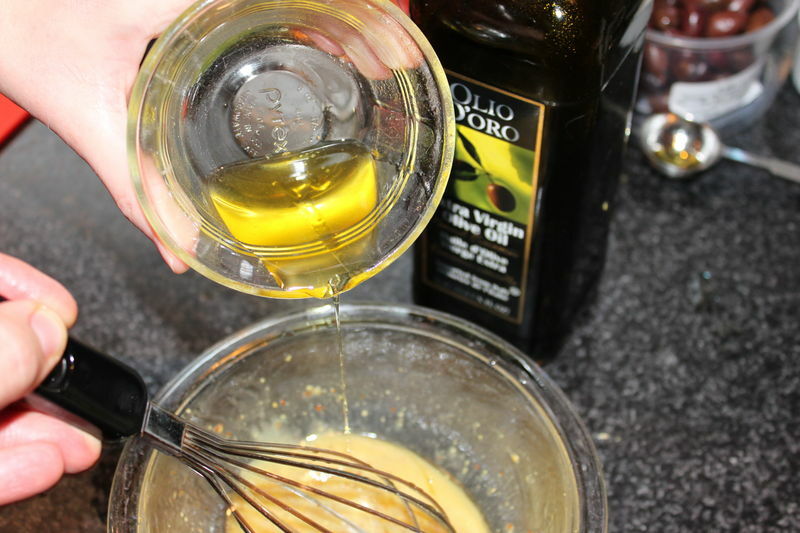 Mustard (powdered or liquid) is an important ingredient to help achieve the emulsion. Besides adding flavor, it helps to thicken the mixture since it’s able to absorb twice its weight in liquid. By soaking up the oil and vinegar it helps to emulsify and keep all the ingredients in suspension. Have all the veggies that need to be pre-cooked prepared ahead of time, and allow to come to room temperature to serve. A hearty salad that is filling enough to serve as the main course. 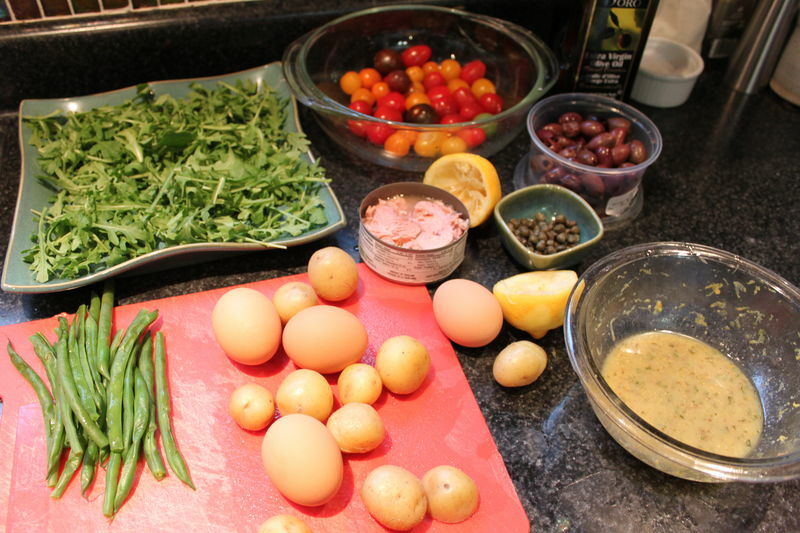 For the salad, boil the potatoes until tender and set aside. To save time I boiled the eggs along with the potatoes! Steam the beans and asparagus until tender crisp. Plunge immediately in cold water to stop them from over cooking. Set aside. Serve veggies at room temperature. For the dressing, in a medium bowl add all the ingredients except the oil. Whisk together, then slowly drizzle in the oil until emulsified and thick (you may not use all the oil, you can stop once you get the thickness you desire). Taste the dressing, and adjust as needed. To serve, plate all the veggies, sliced eggs, and pickled condiments on a large plate, arranging it nicely and in a manner that will be easy for people to pick out what they like. Place some tongs next to the plate, and place the dressing in a gravy boat – or something else like that which is easy to pour.